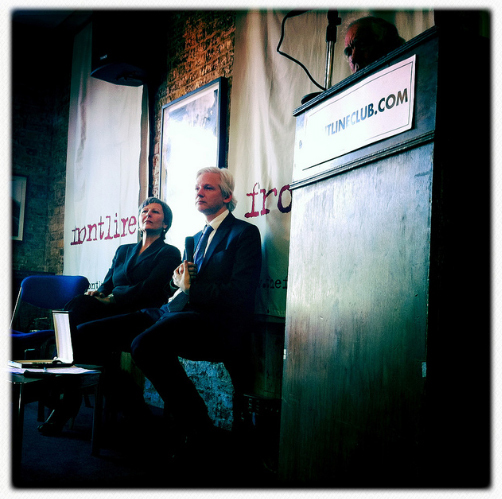 Yesterday WikiLeaks editor Julian Assange was awarded the Sydney Peace Prize gold medal for Peace with Justice at the Frontline Club. You can read our report of events here. After Assange gave his acceptance speech, there was time for a question and answer session. He spoke in depth in reponse to many questions, giving insight into his position on everything from the role WikiLeaks may have played in the uprisings across the Arab world, to his opinion on the News of the World phone hacking scandal. We have already posted the first half of the Q&A here, with word from Assange on the Arab Spring, phone hacking and WikiLeaks’ ethics. There are many who think that [convicted Lockerbie bomber Abdelbaset] al-Megrahi was simply a fall guy who was used to cover up other people who were involved in that atrocity. My question is whether WikiLeaks has information, that goes back to that sort of period (1988), on any conspiracy between the British and American governments at that time in uncovering the perpetrator of that atrocity? We have published quite a bit of material on the Lockerbie bombing. I suspect you will see more soon in [Scottish national newspaper] the Scotsman, but I can’t say off hand whether it will change the view that has evolved over the last year. Some of the media have now tried to set up their own version of WIkiLeaks – the Wall Street Journal for example. I’m just wondering if you’ve had a look at them and what you think about those operations? So we have pushed for a long time for media organisations to be more aggressive in their sourcing and to be more protective of the people who actually are involved [in leaking information]. So in so far as the Wall Street Journal represents a tendency to take up our ideas we were really pleased, and in fact we told everyone: ‘look, the Wall Street Journal’s doing this’. al-Jazeera has also done a similar thing. Unfortunately, it’s not as easy as it looks. It’s not as easy to stand up to influence as it looks and taking heat is not as easy it looks. So, the Wall Street Journal, if you look at the fine print, says that it can sell you out to anyone at any time – law enforcement, any other interests that it feels like. It makes no guarantees. And a security system analysis shows that it is also weak. But there is a broader general principle, that I think that we’re going to see over the next couple of years – as major media organisations try to retain their role of having sources of information coming directly to them and not having any intermediary – and that is: whistleblowers, like writers, need agents. And for all the same reasons: that if they become captive to a particular publisher … they need someone who knows the system and knows how to deal with potential publishers. Similarly, those presenting to a court need lawyers to represent them. And those presenting to the court of public opinion need experts in how to understand the difficulties and dangers of presenting to the court of public opinion. What about the distrust between the ISI [Pakistani intelligence agency, Inter-Services Intelligence] and the US? How real is it? From my reading the distrust has been there for a long time. But when a strong relationship started to occur between the ISI there was computerisation of ISI’s systems by the US – there was also scrutiny of the top tier staff within the ISI. There are divergent interests between the ISI and the United States as I outlined before. I don’t expect those divergent interests to go away. The battle between divergence and convergence I think is possibly on the side of divergence. But that’s just speculation on my behalf. The Wall Street Journal have said that they won’t be able to protect sources. What do you think about that? And secondly, is it possible at the moment to give information to WikiLeaks? Presently we are reengineering our submission system and that has to do with quite a long and difficult story of sabotage of various kinds and the differing and extra hostile environment which we have found ourselves in. However, it is possible to get us information in a number of ways. We’ve also reached a publicity profile so high now that it means we have to do things differently. Because we’ve started to become completely inundated with material. So that’s a matter of the appropriate engineering, and making sure the material is of a particular calibre that fits the size of the number of people who can assess it. It’s quite an interesting psychological problem, when dealing with sources, in that, most sources, most of the time, don’t reveal anything. People can go 40 years without revealing anything and then one day they do. So this is about an activations threshold. That at some point, the feeling becomes strong enough that if they want to act and they then need to be caught at this moment and protected at this moment. And some of them have a feeling that they want to act that is so strong that they don’t care about the risks at all. So one also must protect them from themselves, which is quite a difficult thing to do. So the Wall Street Journal and the similar organisations that whistleblowers are thinking about dealing with: it is not just the technology, it’s a combination of technology and people. The technology is opaque and very complex and sophisticated if done right. So how are you to assess whether the technology has been done right? How are you to assess whether these people will sell you out? You have to look at the people who are running the organisation. What is their history and their experience. Have they stood up to pressure before? And have they managed themselves before? There’s almost no organisations that have that track record other than us – and individual journalists, there’s just a few with a track record of not buckling when they receive pressure. So I advise everyone who’s thinking about disclosing confidential information to look very closely at the track record of the people that they may be dealing with. But don’t Google their name from your home. So the Wall Street Journal doesn’t measure up? No. It doesn’t measure up on any criteria.